1H19 core earnings of RM126.2m is broadly within our (41%) and consensus (38%) expectations on weaker-thanexpected property margins which are expected to pick up in 2H19 alongside stronger recognitions. The acquisition for the remaining 57.5% of DAIBOCI is pending completion by end FY19. Maintain FY19-20E CNP of RM309-349m. Maintain MP and TP of RM8.50. 1H19 core net profit of RM126.2m came in broadly within our (41%) and consensus (38%) estimates on weaker-than-expected property segment margins due to product mix which we expect will normalize in coming quarters, as well as stronger recognitions in 2H19 aided by recent launches. Top-line came in at 46%, but EBIT was dragged down by weaker-than-expected property segment EBIT margin of 29.8% (vs. our expectation of 33.0%, in line with FY18). No dividends, as expected. Results highlight. 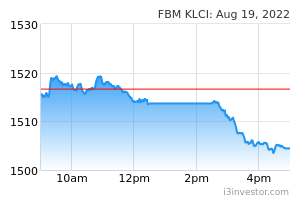 YoY-Ytd, top-line was up by 15% from contribution in the manufacturing segment (+22%), aided by contribution from the acquisition of Klang Hock Plastic and the operation in the United States, while the property segment revenue declined marginally by 1% due to timing differences of recognition. Group EBIT margins declined by 2.0ppt mainly due to lower property segment contributions as the property segment commands high EBIT margins vis-à-vis the manufacturing segment, while the manufacturing segment margins also declined marginally (-0.5ppt) likely due to a less than favorable product mix. As a result, CNP declined by 10% on the back of a higher effective tax rate (+4.0ppt). QoQ, top-line was up by 7% solely due to the property segment (+58%) which saw higher recognition. As a result, Group EBIT improved by 37% on higher contribution from the property segment which commands superior margins vs. the manufacturing segment. All in, CNP increased by 40% on slightly lower financing cost (-10%). Outlook. SCIENTX is focused on ramping up utilisation, targeting above 70% over the next few years, mostly from its BOPP plant and Arizona plant in the United States which will mostly contribute from FY19 onwards. Growth is premised on gradual improvement in utilisation rate for the manufacturing segment, and (ii) full-year contribution from KHPI in FY19. The acquisition for the remaining 57.5% of DAIBOCI is proceeding and we expect the exercise to be completed by end FY19, and to accrete earnings fully in FY20. Note that we have yet to price in the MGO for the remaining 57.5% acquisition of DAIBOCI pending the outcome of DAIBOCI’s shareholders’ decision that may opt to keep their shares or sell it for either cash or in exchange of SCIENTX shares. 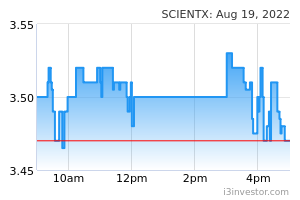 However, we believe the impact to SCIENTX’s EPS (<5%) will be fairly neutral either post the dilution of shares or increased financing cost to fund the acquisition. Maintain FY19-20E CNP of RM309-349m as we expect property recognitions and margins to pick up in coming quarters. We are expecting launches of RM1.1-1.2b in FY19-20, and manufacturing utilisation rates of 65-70% in FY19-20. Maintain MARKET PERFORM and TP of RM8.50 on FY20E valuation to account for the full-year impact to earnings, as well as dilution from the acquisition of 42.5% of DAIBOCI. Our TP is based on our FY20E SoP valuation with; (i) unchanged PER of 10.0x for the Property segment, which is at a 18% discount to small-mid-cap property players and Johor-exposed peers’ PER due to SCIENTX’s exposure in the challenging Johor market, and (ii) an unchanged 15.5x applied PER for the manufacturing segment (a 14% discount compared to SLP’s applied PER given its lower margins of 6-7% vs. 15%, but above TGUAN (9.0x PER) given its earnings stability. Maintain MARKET PERFORM as we believe we have priced in most foreseeable positives.